Tom’s Place. A Toronto institution and my favourite place to purchase quality clothes! Don’t worry, there are still there at 190 Baldwin Avenue in Toronto’s Kensington Market, but what I miss about Tom`s Place is not needing to go in there to build my wardrobe under the guidance of Tom Jr.
You see, I have been in the workforce for 17-years but have never worked for an organization who required (or even encouraged) staff to dress up. Public sector, private sector, entry-level managerial level, and higher, and each organization followed a casual dress code. The most I needed to dress up was for job interviews or for funerals. Then one day I decided that I needed to open my own business and with that I wanted to revamp my wardrobe, and my image, but really had no idea where to go. I wanted to make sure that I shopped at a store which had quality clothes, experienced salespeople and expert tailoring so that I do not have a fiasco like I did previously. I listened to talk radio where I heard an ad on AM640 for Tom’s Place. The next morning I heard morning host John Oakley speaking with Tom’s Place owner Tom Mihalik and I was intrigued. Tom had mentioned on the radio that if you came to the store that you should tell him that you heard him on the radio, mention John Oakley and AM640 and he’ll take a little more off the price. So I asked around again, and it turns out that pretty much everyone from my peer group had been to, and purchased suits from Tom’s Place, and although I am born and raised in Toronto, I honestly had not been to Kensington Market since I was a kid, but the more I heard the ads the more I wanted to visit the store, see what they have and meet the famous Tom Mihalik. Then fortunate for me, a very dear friend of mine, CCG offered to not only take me down there, but also to help me get my wardrobe set up. He is a walking billboard for style so it certainly was an offer that I could not pass up. The rest of this story is my accounting of what became 5 trips down to Tom’s Place over 5-weeks which left me with a brand new wardrobe which is second to none, and a new appreciation for shopping for clothes at a store where the quality of the materials and fabrics is quite evident and the salespeople are second to none! Why I’m difficult to shop for: I’ve always been hard to buy for because I’m active in sports and I’ve been to the gym here and there, plus I like to pick up and toss my children around so buying clothes off the rack was never an option, and any salesperson has to take into account my long arms, large shoulders, muscular thighs and a big back, yet while I taper inwards towards the waist, there is that little bit of extra padding which keeps me from fitting into smaller sizes. It’s downright difficult to fit and one of the reasons I had not done this earlier in life. Add all that to a 6ft, 225lb frame and you can see it’s not an easy, nor enjoyable task buying clothes. I can usually tell the experience of the salespeople when I attempt to try on a sport coat or suit jacket. I’m a 46-tall and when I get handed a 42-regular I know right away what I’m dealing with and to be honest, I really should turn around and walk-out. At Tom’s Place, I had the pleasure of being helped by Tom Jr., and after glancing at my figure, he quickly went away and came back with 3 jackets he thought would work best with my style, size and fit. I enquired right away about the sizing of the jacket and Tom Jr. calmly responded that he had picked, “your size”, which was a 46-tall. Of the 3 suit jackets Tom brought, each one fit better than the other, and the colours were perfect. We tried different styles, and patterns and after trying on 8 suits it was the first 3 that I chose. One grey, one blue and one grey with a very slight pink pattern (very slight because I’m “Classic” so nothing flashy or fancy for me). Then came shirts and ties to match – also in my size – and I was already excited to see what they would look like after it was tailored. Tom Jr. is a very well dressed man, who has a ton of knowledge of the industry and knows how to dress men. When I commented on his suit and shirt / tie combination, he pointed out that the 1st suit he picked for me was the exact same as the one he was wearing. I like that. I let him know that I was hoping to meet his father… Little did I know the Tom’s Place ritual that was to come next. Once at the front of the store to pay for my purchases, there stood Tom himself. Tom Jr explained how I got here – thank you AM640 – and ran through what I had purchased, and the ticket price – out loud – and after every item, Tom changed the price. Then at the end of this, he gave me the AM640 Oakley discount and I paid. Tom thanked me for coming to visit and said that he looked forward to seeing me next week when I came to pick up my suits. Now imagine my surprise when I came back the following weekend, with a different friend and my 2 boys and was greeted by Tom as we entered the store. He thanked me for coming back to pick up my suits, then proceeded to rhyme off what I had purchased the previous week. He also noted I had a different friend and commented that I had my 2 boys with me who promptly received Tom’s Place flashlights. I went back upstairs and there was Tom Jr. who brought me my suits and while trying them on, I mentioned to him that I wished to purchase a sports coat. Sure enough he brought over the most beautiful brown sport coat that I absolutely had to have. It was tailored within 5 minutes and we were down at the front of the store where Tom was discounting my purchase yet again. This went on over 5-weeks and included pants, another jacket, belt, socks, cuff-links, shirts and ties. Each time, Tom Jr brought me the perfect choice for my body-type and each time, Tom Sr. discounted my products, thanked me for coming and chatted with my kids. The saddest part for me was the last visit where Tom Jr. told me that there was nothing else that I needed at this time for my wardrobe, but I should come back towards the end of the summer as I really needed a nice fall jacket and possibly a sweater to go under a jacket and over a dress shirt. Could buying quality clothes that fit and make me look good possibly be this easy?!? It was a couple more weeks before my kids stopped asking if we were going to Tom’s Place today. I thought it was because of the chocolatier across the street of the cafe around the corner that Tom Jr suggested we go, but it was because they wanted to see Tom Sr and Tom Jr. My 6-year-old picked a beautiful jacket for me and my 8-year-old helped Tom pick ties to match my new shirts. So now I know for sure where someone goes in Toronto when they need to dress to impress – for the best quality and best service. 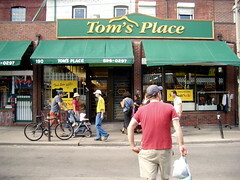 It’s Tom’s Place. I’ve recommended it to as many people as I can and to each and every person who commented on my suits or jackets. Tom Jr. made what has always been a nightmare for me a fun experience, and now I wouldn’t think of going anywhere else to add to my fabulous wardrobe.